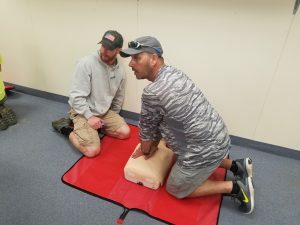 First Aid & CPR Training - Eastern Environmental Contractors, Inc.
At Eastern Environmental Contractors, we are dedicated to achieving the highest level of safety for our employees. Steps toward that goal include getting our entire staff involved in CPR, AED & First Aid training. We are excited and proud to share that we are all now certified in these skills. Less than a week after our employees successfully completed the training, a field employee had to put his skills to use when a male biker collapsed near an active job site. This man required immediate CPR and our EEC team jumped into action. 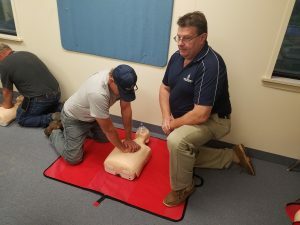 Not only does this stress the importance of learning these life-saving skills, but it also makes us proud to have the kind of people working for us who are able to recognize an emergency situation and handle it appropriately.